When you're a mom of three, a few things that really matters to us just seem weird to other people. We say words like STTN, SAHM, WAHM. Like yay finally STTN! Anyway, my kids aren't fully STTN or Sleeping Through The Night. Why is this so important? Because when you get woken up a few times at night for the past 2 years literally, you kinda look forward to it. 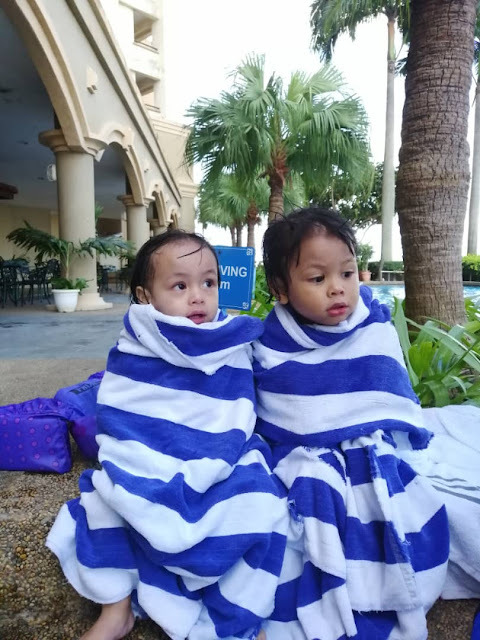 One thing I notice about having two kids so close in age.. is one would be getting over one stage.. and the other would suddenly enter that particular stage. So it's like dealing with a prolonged stage. It's wonderful and chaotic. So Ibrahim has gotten all his teeth.. and stopped waking up at night, he sleeps like a log now. Hassan on the other hand, has started the waking-up-screaming phase, which is a mixture of tooth growth and nightmares. We tried putting Naila to sleep in a separate room, but sometimes she ends up disrupting us in the middle of the night. Seriously feels like we never left the newborn stage at night! I'm still waking up a few times to calm Hassan down. But one good thing is that they know how to put themselves to sleep. A few months ago, I almost got into a depression because I was sleeping at 9pm every night. Yes. Totally depressed for sleeping early. It'll be nice if it was my choice.. but it wasn't. I was putting the kids to sleep and I fell asleep accidentally because the bed was cool, and soft and I'm normally already tired at the end of the day. What I did was to dig back all my materials on self soothing. Yes it's very controversial and many people don't agree with it, but if it draws the line between happy and insanity, you might wanna give it a try. And once it worked, sanity restored 100%. I had my leisure night time again. I'll share some best practices for self soothing some other time but it seriously saved my life. Hassan is 1.5 years now.. he should be fully STTN by the time he's 2-ish. Basically it's another year. I can do this! Now that I've entered my 30s, I realize a few things. I'm a bit weary, a bit wiser and more obsessed with certain things over others. I personally am right in the middle of child rearing wonderland and the quest of a super career. These two don't blend well. Modern advice is, don't try to balance life and work. So I'm taking it. I've thrown balance out the window. I'm the type of person who writes letters to her future self. Writes goals at the start of a new year. Looking back at goals 2016-2018, I achieved maybe one or two off the list. I would feel kind of depressed. Then I ask myself, why am I not achieving these goals? Is it my choice? When I answered yes, I felt better. So I decided to compromise on some things. Then I was thinking, everyone has their challenges. Great people are great despite their challenges. Kind people are kind despite their challenges. My mindset in the past has been.. I need money to be the best I can be. It's shallow but empowering at the time. Roaring 20s. Then I got hit over and over. I started thinking.. what's the lesson in all of this? Is this simply my fate? what is life trying to teach me? Sometimes I cry "why me"? I feel humbled and grounded. A little bit wiser, a little bit stronger. I never truly appreciated the saying "pressure makes diamonds" before. But I think I understand a little now. It's funny you think you know yourself all these while but you keep discovering something when you're forced to dig in. I'm not who I was 5 years ago, or even 2 years ago. It's been a crazy steep learning curve on all sides and I'm just glad I'm still in for the ride. So what's my mantra when I turned 30? Be patient and kind. Also, make it happen! Hi!!! Having three children isn’t a walk in the park. Nor are they friendly for your wallet. That’s why over the years I’ve become very savvy with spending on a budget. I’m still learning and discovering new outlets but so far, I think I’m doing good. I’ve never been this earth friendly until I have 3 kids! The most budget friendly at this point will be cloth diapers. I thought about it, even purchased a bundle in 2013 but decided against it because it didn’t fit our lifestyle. So I settled with the next best thing – bulk diaper buying. My kids wear Drypers. So far they’ve been very practical and does containment exceptionally well. Currently I’m using 2 different sizes, S and L. So I buy them in a box usually from Lazada or Tesco (online of course). They cost me an average RM75 per box. If I have to buy them loose, I’ll pick a packet from 99speedmart. Their prices are the lowest. Ibrahim, my 2nd born is on soy milk, Isomil. An 800g tin would cost around RM80 in Aeon. Different 99Speedmart has different pricing. But so far the cheapest is at chinese supermarkets. My place is near a few of these chinese supermarkets. Their selling price for a tin is RM69. The catch? No debit/credit. Only Cash. Onesies are a babies staple clothing. My babies at home are in onesies 99% of the time. They’re just so convenient and versatile. I get nice Gap and Next rejects at Plaza Massalam for RM10 each. I promise this isn’t as icky as it sounds. We Malaysians love shiny new things. Why not go green and get second hand items. You have to be smart about buying 2nd hand. For me personally, I try to choose items that are NEW or LIGHTLY USED. Yes, they exist on the second hand market… and usually at a fraction of a brand new price. NEW/LIGHTLY USED items I’ve purchased before: sneakers, baby rocker, pregnancy waist extender & car seat. Not everything secondhand is good. You’ll have to be picky but I assure you that it’s worth it and very satisfying when you score a great bargain. Some sellers only use things once or twice before deciding they don’t want something. Proceed with caution though, because bargain hunting this way is very addictive. For important items, I always do COD, which means that you go pick up the items personally so you can see the condition with your own eyes. Always try to shop at one place and get a membership. One that allows you to collect points and redeem vouchers sort of thing. I choose Tesco because I can either shop physically or online and it allows me to collect points both ways. Always compare prices on LAZADA. They have the best prices hands down. I’ve done comparisons with Seng Heng / Aeon / Courts / Harvey Norman etc but LAZADA takes the cake for cheapest price. This goes for bigger brands like Panasonic, Tefal, KDK. We’ve purchased beds for our homestays on LAZADA. Cheap & arrives within 2 weeks. Do you have any favorite hacks to share? We’ve actually been to Krabi twice since I first wrote about it. I can be considered a Krabi family holiday expert now. I personally enjoyed the first time we went more because Naila was 2 years old and we get to do more things. The second time around, we also brought along 7 month old Ibrahim and I was 4 months pregnant. It was a bit tiring compared to last time. But I think the most question I get asked is “why go to Krabi again?” To answer this, I have to tell a story about one guy me & hubs got to know about in Bali. The guy was from Germany. He was treated like an old friend at the villa. And we found out from the owner that he returns every single year. Because he loves it there. It was so simple and profound. It was a mental shift both of us went through in our one month old marriage at the time. So the answer to that question we get so many times is because we love Krabi the first time we went. This time we decided to go by flight. I’m not sure which one is more tiring because on one hand, we arrived in Krabi within 1.5 hours. But the waiting in the airport took a few hours. Naila was excited about the plane ride but Ibrahim couldn’t be bothered. I think more than anything, he was annoyed that we disturbed his sleeping time. We arrived early in the morning at 6 am. We went straight to our hotel because we’ve requested for an early check-in beforehand. That morning, we took a rest for a few hours before heading out to eat. We’re so happy to eat at May & Zin again. Love it. The food is as tasty as it was before. Our hotel has 2 pools and they’re empty most of the time. So we had fun playing at our ‘private pool’ that afternoon. It was Ibrahim’s first time in a pool. He was 7 months old! He loves it! The second day, we decided to go island hopping. Just If you opt for the normal boat, there could easily be more than 15 people on the boat and you would have to follow their schedule. Since we’re totting a 3 year old and a 7 month old, we decided that private boat is the way to go. One of the stops was Hong Island. The kids loved playing in the sea. They enjoyed the sand. The limestone hills were magnificent. At Hong island is also where we swam with the fish. Naila was a bit spooked out by the fishes following and poking her. I think it was the flowery swimming suit that attracted the fish. Ibrahim’s first boat ride. He was behaving so good. Totally enjoyed the wind blowing his hair. We spent the whole day outside on the boat. Luckily the boat was shaded and we brought some snacks on board. Towards the end of the day, we were all so tired. Just going with a baby is a lot of work. Add that I was pregnant. I wouldn’t do it again under those circumstances. I really won’t. I’ll revisit the possibility when the kids aren’t in diapers anymore at least. Here’s Naila really SLEEPING on the plank. Baby Ibrahim was also sleeping on our way back to shore. On the third day, we hung out at the hotel. We ordered hotel food in the afternoon. Sunda Hotel food is good. The breakfast buffet is good, ala carte is also good. No complains there. Hubs went on a diving trip to Koh Phi Phi island. This time around he said the water visibility is great, unlike the last time. It’s supposed to be one of the best times to dive when we went in March. Ibrahim ready to spend the day in Krabi. That night, we went to the night market in Krabi Town riding a tuk tuk. The drive to Krabi Town took about 30 minutes. The tuk tuk was just a motorcycle connected with a contraption that allows 4 adult passengers to be seated. It was very windy to say the least. Upon arriving at the market, I carried Ibrahim in the carrier and Naila was strapped in the stroller. The market had lots of interesting trinkets as should a Thailand market have. And tasty street food. The best thing about being in Krabi is the HALAL FOOD. You can eat anything because they’re halal and cooked by muslims. Halal everywhere. I love it! One of the reasons we LOVE Krabi. So on the final days in Krabi, we strolled along the beach alot, enjoying the sea, sand and sun. Krabi might be an annual thing for our family, because it’s just super friendly for us muslims. It’s different, you get to be in another country, enjoying the beautiful scenery and the food is superb. Last but not least, Krabi is very affordable. I guarantee it will not break your bank. I think that’s the end of my 2nd trip to Krabi story! Thanks for reading! Till next time.